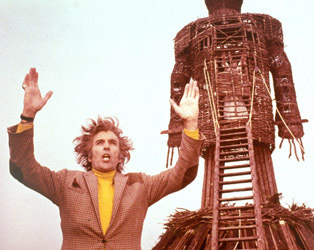 Gaining traction in recent years, the term folk horror has been used to yoke together disparate cultural artefacts that exhibit common traits: an interest in paganism; traditional, rural communities with a connection to the land and its regenerative cycles; the importance of ritual and superstition over scientific rigour. Three UK films are held as exemplars of the genre: Witch finder General (1968), The Wicker Man (1973) and Blood on Satan’s Claw (1971), and while they are central to this season it is our intention to broaden the parameters of the definition to include earlier films that exhibit discernible folk horror traits; the ancient curse of Night of the Demon (1957) and the dreamscapes of Valerie and her Week of Wonders (1970) are antecedents of more readily classic fable folk horror cinema. More recently, The Blair Witch Project (1999) employed a folk horror mythology to popularise the emerging found-footage film. Burn the Witch – to witness the continuing influence of folk horror tropes in contemporary image making.